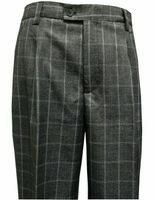 Men's dress pants or slacks if that is what you call them have always been a way to dress in manner that shows that you not only have style but taste as well when worn nicely pressed with a fresh new pair of Stacy Adams Shoes. 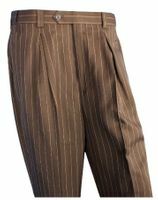 Men's wide leg pants and slacks are a uniquely Urban American Style that you'll find quite stylish an unique with their wide leg baggy style cut that are quite comfortable. You'll find stylish pattern wide leg pants as well as solid color wide leg slacks from 100% Wool to Poly/Rayon fabrics as well. Shop Classy Style dress pants from flat front style to pleated styles that perfect for work and play. Vinci makes all of their dress pants for men who like looking great whatever the situation may be. Stacy Adams employs all of the throwback style and attitude into their collection of dress pants that they have mastered as they have done with their World famous Stacy Adams shoes. These fashion dress pants feature stylish fabrics and are cut in a baggy style that will look great and feel great at the same time. 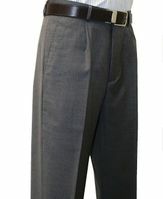 Silversilk dress pants reflect the same attention to high quality and fashion that all of their Silversilk fashion outfits receive. It's all about unique and fine quality fabrics and high quality construction which separates Silversilk dress pants from other brands. Just look at the waist band inside and you'll see exactly why these dress pants are superior. You'll find a selection of classic pleated wool pants, flat front wool dress pants and stylish wide leg wool dress pants for the fashion minded man. Whether you prefer flat front style dress pants or slacks,wide leg pants or pleated dress pants, you know deep down inside that you look your best when you're wearing them. If you're of the Pepsi generation, you'll be in good hands because you'll find flat front slim fit dress pants as well and you'll do the part to look your best when you wear them to the club on a Friday evening to the latest hot spot. Wearing men's slacks also gives the man a much more presentable look affording the wearer a more positive first time impression that wearing a pair of jeans could never do. People generally will take a man far more seriously if they are wearing dress slacks than if they were not. 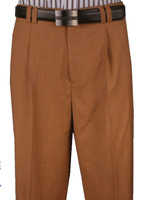 Here at Contempo, you'll find men's dress pants and slacks that will fit most budgets and style requirements. 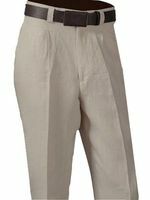 If pleated pants is how you roll, you'll see that Contempo has pleated dress pants and slacks in a variety of styles and fabric choices such as poly/rayon and all wool fabrics. Our pleated dress pants come in both regular fit and for you cutting edge dressing men, wide leg styles that keep those those Stacy Adams Shoes looking right when you step out of your ride. Whether you wear plain front pants or pleated pants, you'll find the style you're shopping for at Contempo.